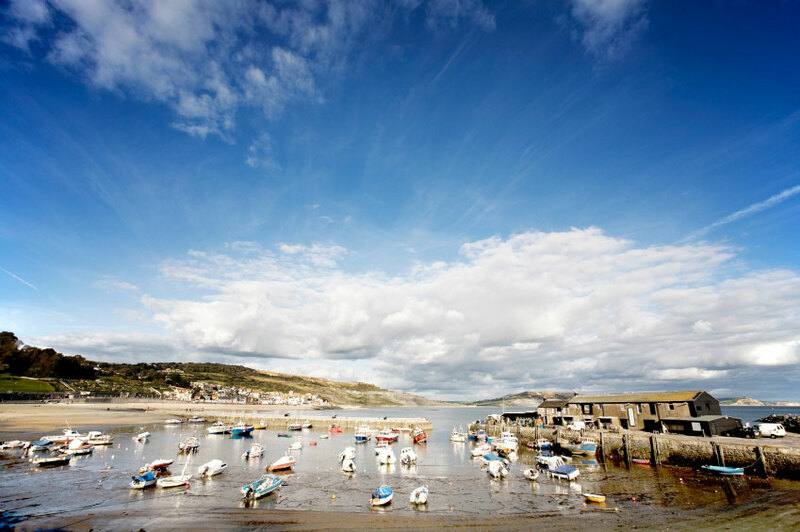 Situated at the mouth of the river Lym, Lyme Regis is the most westerly town in Dorset. It lies halfway between Exeter, to the west, and Dorchester, to the east, and is known as “The Pearl of Dorset”. 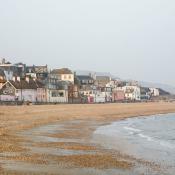 The first reference to the town of Lyme dates from 774, when it was mentioned in connection with a manor granted to Sherborne Abbey by the West Saxon King Cynolf. It is also mentioned in the Domesday Book of 1086. 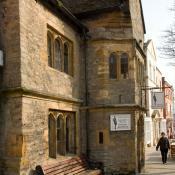 The addition of the word “Regis” to the town’s name was the result of the royal charter granted by Edward I in 1284. By this time the town had developed into a major British port. There was a well-defended siege here during the English Civil War and the Monmouth Rebellion began here in 1685, when the Duke of Monmouth landed at the port. 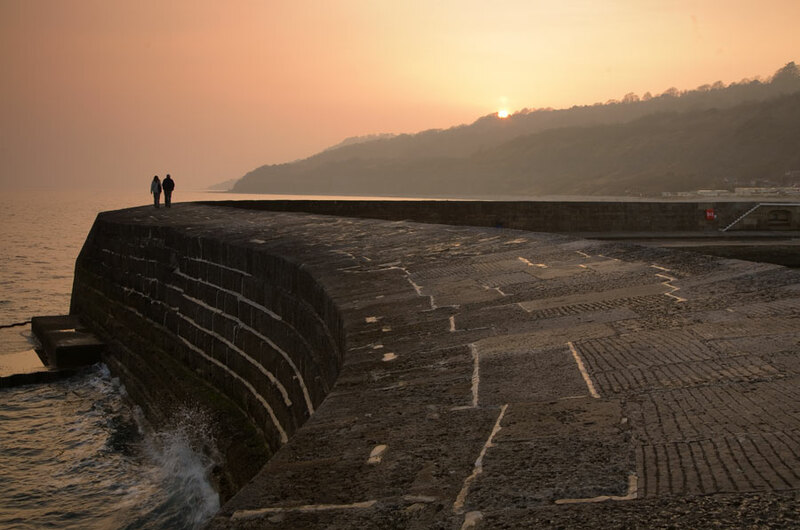 Lyme Regis is perhaps best known for the Cobb, a protective harbour wall built during the early years of the port. 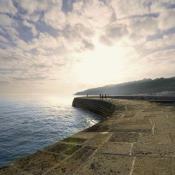 It provided an artificial harbour and a protective breakwater to shelter the town from storms. 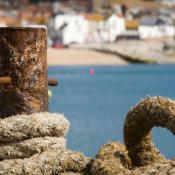 The first mention of the Cobb is from an early 14th century report, mentioning serious storm damage to the structure. 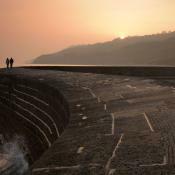 The Cobb was originally detached from the shore at high tide, but was eventually completely attached in the latter half of the 18th century. Early the following century, it was completely reconstructed in Portland Stone. 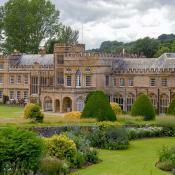 Jane Austen stayed in the resort and featured it in two of her novels – “Persuasion” and “Northanger Abbey”. 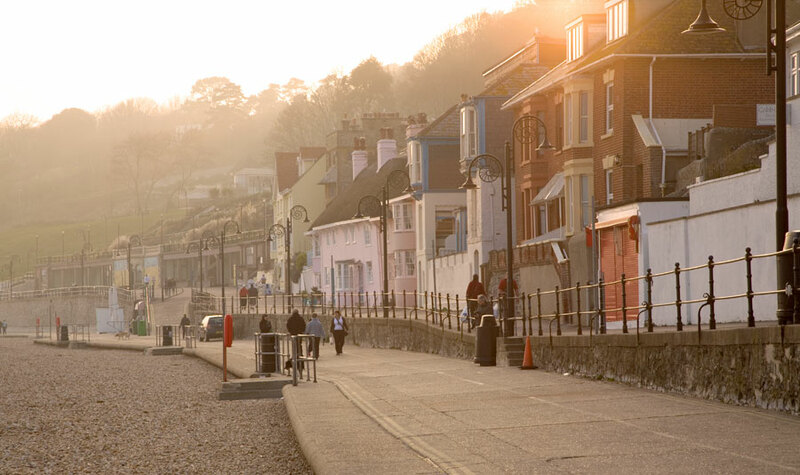 Author John Fowles lived in Lyme Regis and his best-known novel, “The French Lieutenant’s Woman”, was set here. The film adaptation also features the famous Cobb. 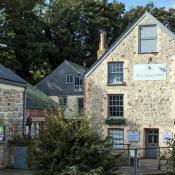 Another landmark in the town is the ancient 14th century watermill, recently restored to working order. Lyme Regis is also famous for the many fossils found embedded in the Blue Lias rock of the cliffs and on the beaches. 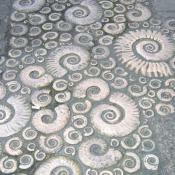 It is part of the Jurassic Coast, which is a World Heritage Site. 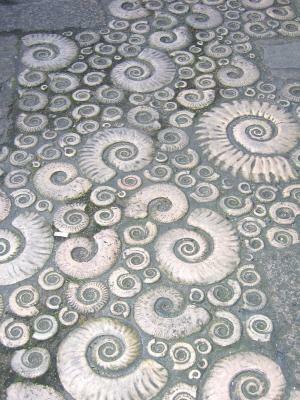 Some of the earliest discoveries of the remains of dinosaurs and other prehistoric animals were made in the Lyme Regis area. 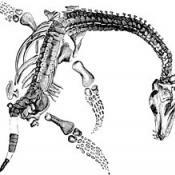 Many of these, including Plesiosaur, Ichthyosaur, Dimorphodon and Dapedium, were made by Mary Anning, the "Princess of palaeontology", in the first half of the 19th century. Naturally, there is a dinosaur museum in town, the Philpot Museum. 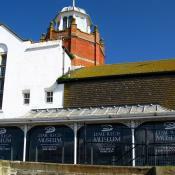 There is a good selection of shops in the town centre and various leisure activities are available. 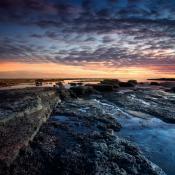 This part of the coast offers some lovely walks, along the Cobb and elsewhere. 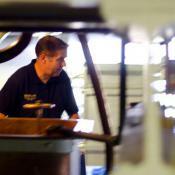 There are various events throughout the season, from the annual jazz festival to a regatta. Beach huts are available for hire throughout the summer and there are lots of opportunities in the area for both water sports and boat trips. 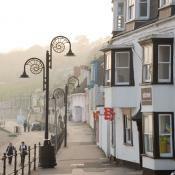 Lyme Regis has many restaurants, cafés and bars and is as attractive today as it was in the time of Jane Austen.